...that's because they are some of the guards. 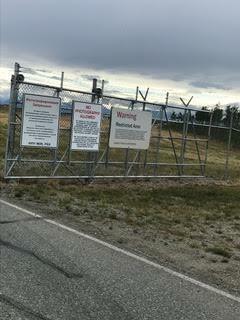 This is a pic I took before going into the restricted missile field area on Alaska’s anti ballistic missile base. With all the “Russia collusion” crap, I thought it was funny. The signs are only in english and Russian. The guards in the restricted area are all Puerto Rican, and Russian. All of them. And by Russian I mean you can barely understand their english when trying to talk to them. And none of the Puerto Ricans speak english to each other. Anyway, just another puzzle. The Puerto Ricans are a pretty fun bunch, and I laugh thinking about how some of the Anti immigrant folks at Target Liberty would faint if they only knew what happens in the real world. Just curious: why are there Russians there? Doing jobs Americans won’t do? Ha that’s exactly what I thought Evan. Trump has handed over US ABM base to Putin!! !